Deuce became part of my work life sometime during the 1997-98 school year. I was an aspiring sports writer, working at the Beaver County Times and being mentored by John Perrotto, who I still consider the best sports reporter in Western Pennsylvania, and Bill Utterback, a top-notch writer whose abilities supercede those of newsprint. Once you get to know Deuce, you have stories to last decades. He’s a statistics-keeping force of nature that can only happen in Western Pennsylvania. Two of these Deuce cards hand at my desk. 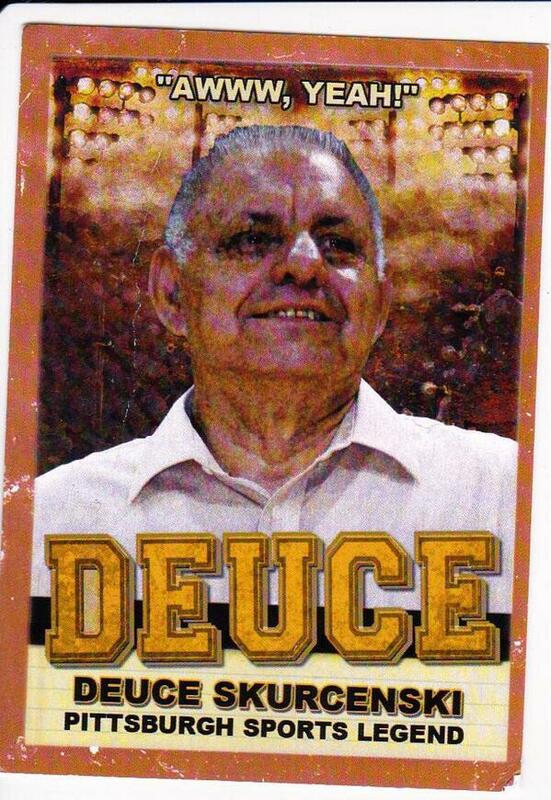 They weren’t the only Deuce baseball cards. I can’t forget sitting beside Deuce at Three Rivers Stadium during the 1998 WPIAL football championships. I was there, with Utterback, Jim Equals, Bill Allmann and crew, covering the Class A tilt – as Deuce would say – between Rochester and Monaca, and the triple-A fray – another Deuceism – between Blackhawk and Moon (if memory serves correct). Well, I didn’t have Ruggerio or Alexander for eight or nine yards.I wasn’t covering the game, something I told Deuce repeatedly. He never stopped asking. A year later, I was working at the Observer-Reporter and covering the Class AA championship game between Waynesburg and Wash High. The Raiders were rolling when, at halftime, I went to the restroom. Deuce was at the urinal beside me, and he kept looking over with that look – the one that indicated he had something important to say. “What’s up Deuce?” I asked, a slight regret in my voice.. There was the time Deuce was supposed to drive to Uniontown with me for a big-time hoops game between Peters Township and the Red Raiders – two of the top Quad-A teams in the state at the time – but he backed out at the last minute. If you know his history with Uniontown, you understand why. For all the funny stories and sayings Deuce provided sports writers, coaches and athletes, he always greeted you with a smile and a handshake. He always called you by name. He always identified where you worked. He always told you to tell co-workers that, “Deuce Skurcenski says hello.” One thing I always admired about Deuce, to him, it didn’t matter if you worked at a weekly, a low-watt radio station, a suburban daily with a dwindling subscription base or one of the big metros, he treated you the same. And that’s to say he treated you well. Deuce was also a tremendous self-promoter. He carried Deuce baseball cards. He autographed them and personalized them. He told you how many football and basketball games he attended, whether it was for the Post-Gazette, Woodland Hills High School or himself. Many of those cards still hang at my desk. Thank goodness his essence was captured in an entertaining 2008 documentary, a film Chris Dugan and I made sure to attend during a special screening at a South Side theater. Still remember a wide-smiling Deuce asking us what we thought about the flick afterward. Lawrence “Deuce” Skurcenski died Tuesday night. He was 73. Old friend Mike White of the Post-Gazette knew Deuce as well as anyone in the region, and he wrote this obituary. High school and small-college sports in Western Pennsylvania won’t be the same. This entry was posted in Friends, High school football, Journalism, Sports and tagged Awwwww yeah, Beaver County Times, Deuce, Deuce Skurcenski, Deuce the movie, High school sports, Observer-Reporter, Pittsburgh, Post-Gazette, Western Pennsylvania, WPIAL on August 19, 2015 by mikekovak. When it comes to adventure activities, this blogger is a big-time fan and regular participant. Never before, however, did I have the pleasure of ascending 30-40 feet into the trees at North Park outside of Pittsburgh, where British-based Go Ape has a tree-top adventure course. It comes complete with five zip lines, two Tarzan swings – including one with about a 35-foot flight into a hanging cargo net, countless obstacles and difficult rope ladders to come. In other words, it’s the perfect place for someone like me. And I was fortunate to get there last week with Observer-Reporter staff writer F. Dale Lolley, who covers the Steelers and doubles as Outdoors editor. Lolley wrote a story for his Outdoors section, and I got to wear the O-R’s go pro camera while working my way through the course. For more information on Go Ape, click here. This entry was posted in Fitness, Journalism and tagged Go Ape, Links, North Park, Observer-Reporter, Outdoors, Steelers, Treetop adventure, Video on June 14, 2015 by mikekovak. A couple weeks ago, I attempted to hang with a group of teenage all-star basketball players, as mentioned here previously. The article appeared in Monday’s edition of the Observer-Reporter. This entry was posted in Fitness, Journalism, Sports and tagged High school basketball, Observer-Reporter, Video, Wash High, Washington Pa, YouTube on April 6, 2015 by mikekovak. Drew Schifino was already considered one of the best basketball players from the WPIAL in some time when he entered legendary status. It happened during the winter months of 2000. The highly skilled guard, a player talented enough to play any position on the court for Penn Hills High School, carried a good, but inconsistent team to a WPIAL Class AAAA championship. To say Schifino single-handedly won the title might not be fair, but, yeah, he pretty much won a district basketball championship in the state’s largest classification by himself. Schifino took over games, set a postseason record for points scored and Penn Hills dispatched several good teams along the way. How good was the Peters Township, one of the teams Penn Hills defeated, in the 1999-2000 season? Well, the Indians, led by Eric Lang, went to Uniontown and left that overflowing gymnasium with a win. Remember, at the time, the Red Raiders were in the midst of an amazing multi-year run as an elite Quad-A team. Wins like the one in Uniontown earned Peters Township the top seed in the WPIAL playoffs and a first-round bye. The Indians reward? A quarterfinal game against Penn Hills. Schifino put on a show. He scored at will and carried Penn Hills to a four-point win. The rest of the WPIAL playoffs followed a similar pattern. Schifino played otherworldly basketball, his teammates offered just enough help and Penn Hills won a WPIAL title and went all the way to the PIAA semifinals before it lost to Uniontown. Schifino’s record-setting postseason display drew praise from every corner. Heck, even the holier-than-thou columnists from the Post-Gazette took notice. Considering how those scribes rarely “stoop” to writing about a high school athlete offers an idea of how much attention Schifino garnered. From Penn Hills, Schifino went to West Virginia University, where he ended up leading the Mountaineers in scoring before being suspended indefinitely. He’d eventually land at Cal U., a frequent stop for former Division I athletes from Western Pennsylvania. Schifino played professionally overseas and again drew attention when he made anti-gay slurs on Facebook concerning Dallas Cowboys quarterback Tony Romo. The social media posts and problems at West Virginia were in the past, and Waynesburg Central High School made Schifino its boys basketball coach before the 2013-14 season. By all accounts, Schifino exceled in the role and pointed an anemic basketball program in the right direction before filling the opening at Steel Valley, a location much closer to his home, before the start of this season. Steel Valley had its ups and downs, players and coaches dealt with behind-the-scenes difficulties, but the Ironmen still managed to make the Class AAA playoffs – another testament to Schifino’s burgeoning coaching career. Behind the scenes, however, is where stories differ depending on the source, but it boiled over hours before Steel Valley’s playoff game against South Fayette. That’s when Schifino learned senior center and leading scorer Dom Keyes was ruled academically ineligible. The timing was certainly curious, and the decision obviously angered Schifino, who refused to coach the playoff game, which South Fayette won handily. Schifino claims he wants to return to Steel Valley next year, and told the Post-Gazette that the school board at Steel Valley wants him back. The question is why? Schifino quit on his kids. There’s no way of sugar-coating it. Why Steel Valley or any other WPIAL program would give him a head coaching gig following this transgression would be something more than head-scratching. No matter what was going on out of public view, to let down players is unforgivable. What if Keyes slipped getting on the bus and couldn’t play? It’s life. Things happen. How you deal with it speaks volumes. And this was an instance where Schifino, unlike the 2000 postseason, didn’t deal with adversity well. High school athletics is about the student-athletes. Always has. Always will be. No matter your previous credentials, it’s never about the adults. This entry was posted in Journalism, Sports, Uncategorized and tagged Cal U, Coaching, Post-Gazette, Waynesburg, WPIAL, WPIAL basketball playoffs, WVU on February 22, 2015 by mikekovak. Oh, Ottawa Sun. Shame on you, and thank you. The newspaper to the north reported Canadian soccer star Sidney Crosby – the fellow from the Pittsburgh Penguins who lit up the 2013-14 regular season but flamed out in the 2014 postseason – was arrested late Tuesday night while driving a rented Porshe in Ottawa. Problem was Crosby wasn’t in Ottawa, he was in Vail, Colo., reportedly training for the upcoming Canadian soccer season. Tsk, tsk Ottawa Sun. Checking facts is a crucial step in Journalism 101. As the story evolved this morning, Chief of Ottawa Police Department, Charles Bordeleau, went as far as taking to his Twitter account to confirm Crosby was not arrested. On behalf of those who prefer their sports stars a little more Lawrence Taylor than Larry Bird, bummer. Had the report, which the Ottawa Sun quickly deleted without nary a correction, been true, it would have made Crosby come across as human. Here in Western Pennsylvania, we’re spoon-fed an image of Saint Sid since the Penguins made him their cornerstone in 2005. Whether you love, hate or don’t care about Crosby, there’s no denying he’s as boring a “superstar” as there is in sports. Maybe as there’s ever been in sports. And, if you believe many in the local media, Crosby is Saint Sid. He only asks ladies out for sodas and roller skating, eats his veggies, says prayers before bed, walks elderly people across the street, is working on a cure for Ebola, listens to the Partridge Family, watches Full House and is perfect in every way, except in those pesky playoffs. John Steigerwald, who writes a weekly column for the Observer-Reporter, often compares Crosby to any athlete who gets in trouble and tells us how lucky Pittsburgh is to have such an upstanding citizen. I know. I edit his columns most Saturdays. Granted, Pittsburgh is lucky to have Crosby playing hockey there. He deserves some credit for saving the franchise. But, does anyone truly believe Crosby is as squeaky clean as he’s portrayed? It’s why the swift, yet understandable, backlash from local media via social media to the Ottawa Sun’s ridiculous excuse for reporting was so humorous. Sometimes, it’s hard deciphering who loves Saint Sid more – fans or some who cover the Pens. Maybe there’s no distinction, but thank goodness no local outlet ran with the Crosby arrest story. This entry was posted in Journalism, Penguins, Sports and tagged Bad reporting, Ottawa Sun, Penguins, Sidney Crosby on September 3, 2014 by mikekovak.